Class of 1998 inductee Paul Krause is the National Football League's all-time leading interceptor. 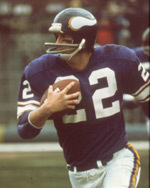 The four-time All-Pro picked off 81 passes during his career with the Washington Redskins (1964-1967) and the Minnesota Vikings (1968-1979). The following is an interception-by-interception breakdown of those interceptions. Krause intercepted the passes of 45 different quarterbacks during his 16-season, 226-game NFL career which he returned for a total of 1,185 yards and scored three touchdowns. On December 2, 1979, he surpassed the career mark of 79 career interceptions held by Hall of Famer Emlen Tunnell. Rod Woodson's 71 career steals ranks him third all-time. *** Note: Krause also had 5 yards on an interception return that came on a lateral from CB Bobby Bryant who intercepted Baltimore Colts' QB Earl Morrall on Sept. 28, 1969.